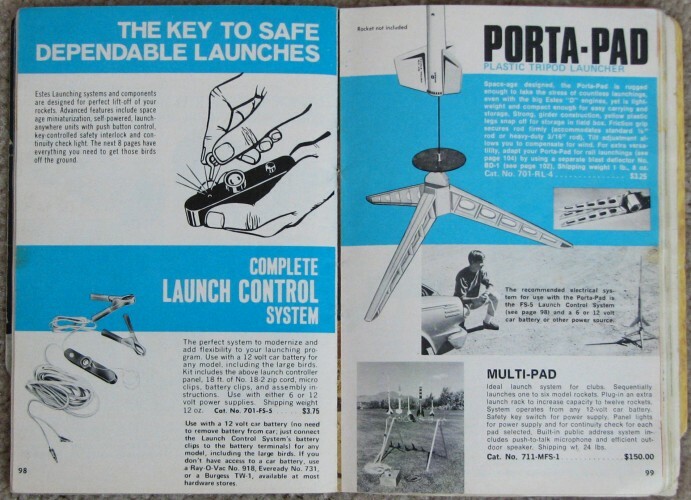 My first Estes Porta-Pad launch pad, purchased sometime in the late 1960s, was made of wood. It got a pretty good workout over the decade or so that I was flying model rockets. Sometime between then and the one shown below in the 1971 Estes Model Rocketry Catalog, the construction changed to plastic. In a quest to re-acquire many of the model rockets that I owned as as a kid, I have been going on eBay. Some of the prices people are offering for model rocket kits and model rocket accessories is incredible. These things can go for $40 more more (plus shipping) on typical auctions. Here (left) is the Estes Porta-Pad that I purchased on eBay.